How Bayonets Work - Meyer Tool & Mfg. Editors Note: This is one of a series of introductory articles on topics in cryogenic engineering. We hope these articles will be of interest to newer workers in the field and introduce topics that might otherwise be taken for granted. Figure 1. A demountable flange in a vacuum insulated pipe. Different elements of cryogenic equipment are often connected by vacuum insulated piping in order to transfer cryogenic fluids with low losses. The inner pipe, carrying a cryogenic fluid, is enclosed in an outer evacuated pipe to provide an insulating vacuum. An MLI blanket would normally be included to reduce the radiated heat load from the warm outer wall to the inner pipe. In the case of liquid helium, vacuum insulated piping is essential. Even in the case of liquid nitrogen, which is much less expensive and has a much higher heat of evaporation, vacuum insulated pipe is often used. In an accelerator laboratory, for example, this installation might include a helium liquefier and a storage dewar connected to a series of superconducting RF cavities and magnets. These installations are usually not entirely permanent. Magnets and cavities may be upgraded or configurations changed. The liquefier and other elements may be disconnected for repair and maintenance. 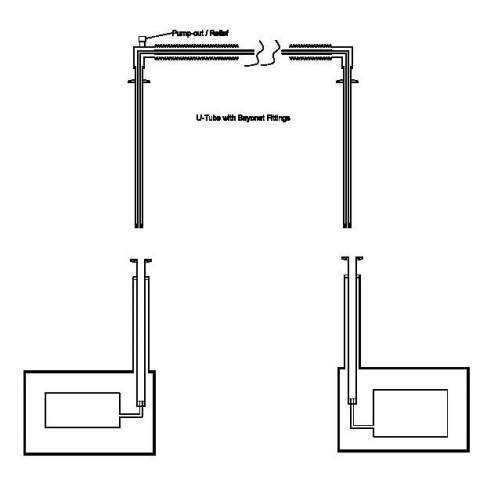 Demountable connections for the cryogenic fluid distribution system are often desirable. A demountable connection in vacuum insulated piping is most often in the form of a bayonet. To see why bayonets are so popular consider the alternatives. We could try joining the inner lines of our vacuum insulated pipe with a demountable flange. To gain access to this flange we might join the outer sections with a sufficiently long section of flexible bellows to allow the outer flange to be pulled back to access the inner flange. As an alternative we could place a tee in the outer pipe that would allow access to the inner flange. In either case we must make the outer vacuum pipe large enough to accommodate the flange of the inner pipe and allow enough room to access the inner flange. The result is a large, awkward and expensive arrangement. Moreover, to break the connection we must break the isolation vacuum on both sides. Disconnecting the inner flange exposes both sides of the system to atmosphere, so the system must be warm before it is disconnected and purged of air after it is reconnected. In many cases this will be very undesirable. The device on one side of the joint might be a large storage dewar full of liquid, for example. The bayonet is a practical alternative which provides for separate isolation vacuum spaces on either side of the connection. Each side of the bayonet is a pair of concentric tubes which form a vacuum insulated pipe. The bayonet is designed such that the outer tube of the male bayonet fits closely inside the inner tube of the female bayonet. The bayonet is relatively long to provide for thermal isolation between the room temperature end of the joint and the cold piping. When one bayonet is inserted in the other and a cryogenic fluid flows inside the inner tube a static column of vapor fills the region between the two bayonets. The sizes of the bayonets are selected for a close sliding fit to keep the dimensions of this vapor column to a minimum and reduce heat loss due to convection in the vapor column. An o-ring at the coupling flange seals this volume. By using long, thin-wall tubes for the bayonets a low heat leak can be achieved. Bayonets of this type should always be installed within 45 degrees of the vertical position with the female bayonet on the bottom to maintain the column of gas between the warm end and the cold end of the bayonet. This column of gas, with the warm end at the top and the denser cold end at the bottom will not contain convection currents driven by buoyancy. The coupling flanges where the O-ring seal is located are frequently clamped flanges in low pressure applications to make installing the bayonets quicker and easier. This helps to minimize the opportunity for contamination when the systems being connected are clean. Clamped flanges may be used at pressures up to several atmospheres. This may be the case when helium vapor is distributed as a supercritical fluid and expanded to produce liquid at the point of use. It is also sometimes desirable to tap into the cold gas at an intermediate stage of a liquefier, in which case the pressure may be much higher. The use of a threaded coupling nut to hold the two halves of the bayonet together or a bolted flange makes it possible to use this connection with relatively high supply pressures. The sizes of bayonets vary considerably, from an inner tube OD of a fraction of an inch to several inches. Many designs incorporate a cold seal at the tip of the male bayonet. These are usually made of teflon. Of course, it is unlikely that a gas-tight seal will be maintained when the junction is cold. However, the seal may help to inhibit convection. In the real world bayonets are sometimes installed horizontally. In this case the cold seal may help to impede the flow of cold vapor and reduce losses due to convection. Figure 3. System incorporating U tubes with bayonets. Bayonet connections are sometimes used directly on liquid reservoirs. When this is done, the bayonet should be positioned high enough to prevent liquid from rising into the annular space between the bayonet tubes. Allowing the liquid level to rise into this space will increase the heat leak by reducing the distance between the warm coupling flange and the liquid level. The coupling flanges on a properly designed and installed bayonet will normally remain close to ambient temperature. However, if liquid is allowed to rise into the annular space between the bayonets then these flanges could cool and cause the rubber o-ring to leak. 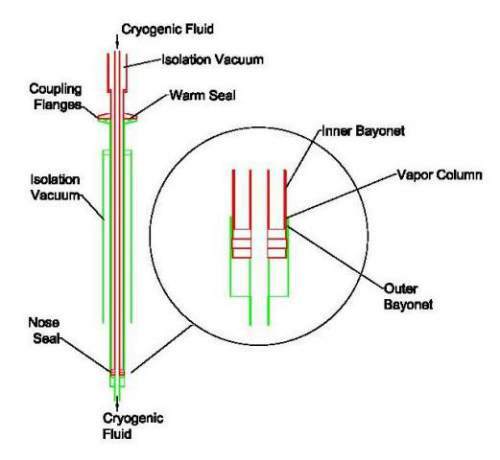 To connect a source of cryogenic fluid to a point of use, it is common to connect two bayonets by a length of vacuum insulated tube to form a U tube or transfer line. Some provision must be included to allow for thermal contraction of the inner tube. This may be in the form of a bellows. Since the vacuum space is sealed at either end, the U tube vacuum space requires its own pumping port. Because the isolation vacuum is a sealed volume in which frozen air could accumulate if there is a leak to the outside, a pressure relief device is normally included. This is to avoid over-pressure in the U tube outer vacuum shell when it is warmed up. U tubes often include a flexible section to allow for mismatch between the locations of the receiving ends and to make it easier to insert or remove one side of the U tube at a time. Keeping systems clean is often paramount in cryogenics. In liquid helium systems in particular, care is normally taken to pump out air and replace it with helium gas before cooling down. Once a system is clean, it is normally kept under positive pressure with helium gas to preclude the possibility of an air leak into the system. Another advantage of the bayonet is that it allows connections to be made and broken without exposing the entire system to air, as was the case with a simple demountable flange. This is done by inserting or removing the bayonet under a helium gas purge and replacing the male bayonet with a cap or a dummy bayonet as soon as it is removed. In some bayonet designs, the female side of the bayonet includes a ball valve and a shaft seal to the male bayonet at the top. This allows the system to be valved off after the mating bayonet is pulled clear of the ball valve but before it is extracted completely, making it easier to avoid contamination. In these systems it is still good practice to use an evacuated dummy bayonet at unused ports to prevent an unnecessary heat leak into the system. With care, bayonet connections can be made and broken without shutting a system down. Before disconnecting a bayonet it is necessary to insure that the supply pressure has been removed. The "stinging" or "unstinging" of bayonets in a live system is then performed with a slight positive warm gas pressure to provide a purge and prevent contamination. Consider the arrangement shown in Figure 3, for example, which we assume is a helium system. In a typical U tube operation we might start with the U tube removed completely and caps on both female bayonets. Both of the "systems" represented by the rectangular boxes are assumed to be clean and possibly cold. Using temporary fittings, the right side of the U tube is sealed and the left side is connected to a vacuum pump and a supply of warm helium gas. Air is evacuated from the inner tube of the U tube and replaced with helium. This is normally repeated several times to insure that the contamination levels are very low. With the helium supply connected at the left side of the U tube, providing a purge, the plug and the cap are removed from the bayonets on the right side and the right bayonet is inserted under purge. The gas supply on the left side of the bayonet is shut off and the bayonet is pressurized from the system on the right. With a purge supplied by the system on the right, the cap and the temporary fittings on the left are removed and the left bayonet is inserted.. Figure 4. A 1-3/8" OD bayonet pair. ​To see what sort of heat leak we might expect from a bayonet of this type, we consider a design which is popular at many of the national laboratories; this bayonet has a 1.375" OD 0.035" wall tube serving as the outer tube of the male bayonet and a 1.5" OD 0.035" wall tube serves as the inner tube of the female bayonet. The length from the room temperature flange to the cold end is 27" (0.68 m) The heat leak down both tubes is approximately equal to twice the heat leak down one tube with a mean diameter of 1.4" (0.036m). This is a rough estimate. We have neglected the heat leak through the bayonet (perpendicular to the axis). For a real bayonet of this size, correctly installed, the actual heat load will be about twice this. Bayonets may be offered with a number of features. In addition to valves and nose seals, some bayonets are offered with a plating on male bayonets to reduce galling. The bayonets illustrated here are intended to be suitable for liquid helium service. Bayonets for liquid hydrogen, liquid oxygen or liquid nitrogen may be shorter, as larger heat leaks can be tolerated with these fluids. Vacuum insulated U tubes are also used to transfer liquid helium between dewars or from supply dewars to cryostats. These U tubes frequently connect directly between helium spaces and may not use a vacuum insulated female bayonet. A tube fitting at the top of the dewar is used to make an o-ring seal to the outer diameter of the U tube, often referred to as a transfer line in these applications. In many of these applications, the flow of liquid helium that must be maintained is very small and consequently a very low heat leak is required. This can often be achieved by allowing extra space for thicker and less dense MLI blankets, more careful design of spacers which position the inner tube inside the outer tube and minimizing the lengths of flexible sections, which tend to have higher losses than rigid sections. In some cases actively cooled transfer lines are used. Typically an actively cooled transfer line will draw liquid from a dewar through two coaxial tubes, which separate once inside the vacuum space. One flow path provides the "shield coolant" and exits prior to the receiver side while the main flow is delivered to the receiver side. This type of transfer line would be used in applications such as delivering liquid helium to a sub-Kelvin cryostat from an external supply dewar. Dr. Herrick L. Johnston is credited with inventing the cryogenic bayonet connection at Ohio State University in the years following World War II. This development was part of a larger effort to expand liquid helium and liquid hydrogen facilities with one important application being liquid hydrogen fueled rockets. ​Bayonets are a practical way to make demountable connections in vacuum insulated pipe. By separating the isolation vacuum of different elements, they make it possible to break cryogenic connections without breaking the isolation vacuum. Bayonet connections also make it possible to break connections in a system without contaminating the system. Bayonets come in a wide range of sizes. At Meyer Tool we have been making and installing bayonets for over forty years. Put our experience to work for you in your next project.